Clark Kent came to the Fill yesterday. Or at least the avian version did. Kent, you’ll recall was the shy reporter whose alter ego was the awe-inspiring, colorfully clad Superman. On regular work days, Clark wore a plain gray suit, glasses, and a fedora. But when crisis called, he would step into a phone booth, tear off his glasses, rip open his shirt, and reveal a garish get-up of red, blue, and yellow, ready for action. Our own (avian) version of mild-mannered Clark Kent was a winter-plumaged Eared Grebe, a duck-sized puffball of a waterbird garbed in gray flannel above and dress white below. So nondescript is this bird in winter that I didn’t think I would ever be able to identify one at the Fill. Few people have. In the past 30 years, only four Eared Grebes have been reported here. In the summer, though, there is no mistaking this bird. Like Superman, Eared Grebes dress so flamboyantly even Edna Mode (superhero design queen) would be impressed. Streaks of gold shoot out in rays from behind the grebe’s lava-red eyes, creating a solar flare against the night-dark black of the bird’s head and neck. Rich chestnut glows along the bird’s flanks, a banked fire serving as a base for the flaming gold and red above. Our grebey Clark Kent never morphs into Superman at the Fill though, and not because we lack a phone booth for the guy to change in. 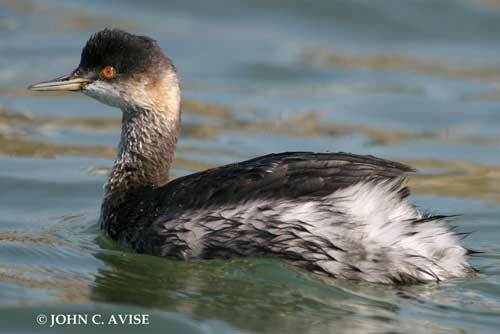 Eared Grebes change only when it’s time to breed, and they don’t breed here. Instead, they form dense colonies in the pothole ponds of eastern Washington. It is there they put on their superpowered displays. All we see here is the ashy aftermath in smudges of black, gray, and white. This particular Eared Grebe was diving for fish just beyond the edge of the lily pads that float near the shore where the Loop Trail parallels the lake. I wouldn’t have picked him out from the other more common grebes if fellow birder Evan Houston hadn’t come by with his scope and zeroed in on him. Together, we watched the grebe dive over and over, staying atop the waves only briefly before submerging again. A bird on a mission. A big thrill for us. This entry was posted in Uncategorized on October 31, 2011 by constancesidles.